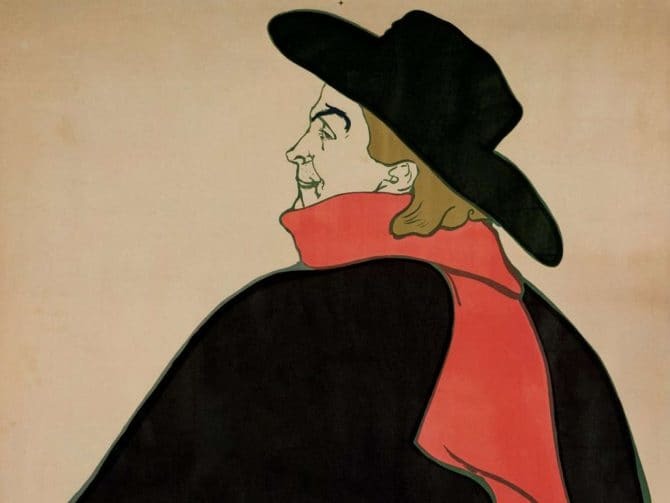 BOSTON (April 1, 2019)—Paris was the center of nightlife and spectacle in the late 19th century, a moment immortalized in evocative posters, prints and paintings by Henri de Toulouse-Lautrec (1864–1901). The artist’s extraordinary attention to the performers, dancers and actors of Montmartre—the heart of the city’s bohemian nightlife—is the focus of Toulouse-Lautrec and the Stars of Paris, on view in the Ann and Graham Gund Gallery from April 7 through August 4, 2019. The exhibition of approximately 200 works is a collaboration between the Museum of Fine Arts, Boston (MFA), and the Boston Public Library (BPL), drawing on both institutions’ extensive holdings of rarely displayed graphic works by Toulouse-Lautrec. It also includes a selection of loans from the Harvard Art Museums, the Houghton Library of Harvard University and the Metropolitan Museum of Art, as well as local private collectors. Toulouse-Lautrec and the Stars of Paris explores the artist’s enthusiastic participation in the celebrity culture of his day and how, to a remarkable degree, he defined it for generations to follow. In addition to his famous lithographic prints and posters, which distilled the defining gestures, costumes and expressions of “les stars” of the day into instantly recognizable images, the exhibition features never-before-displayed early drawings and a selection of paintings by Toulouse-Lautrec. Works by his contemporaries, including Pierre Bonnard, Mary Cassatt, Edgar Degas, John Singer Sargent and James Jacques Joseph Tissot, are also incorporated throughout the galleries, as well as recently restored period films, music, instruments and fashion accessories. The exhibition is accompanied by an illustrated catalogue produced by MFA Publications and a range of public programming offered at the Museum and the BPL’s Central Library and 25 neighborhood branches. MFA members are the first to see Toulouse-Lautrec and the Stars of Paris during Member Preview (April 2–6, 2019). BPL cardholders can sample MFA membership with free admission throughout the month of June 2019, and as part of Encore Boston Harbor’s sponsorship, Everett residents will receive free admission to the Museum throughout the run of the exhibition. “Toulouse-Lautrec and the Stars of Paris” is organized by the Museum of Fine Arts, Boston, and the Boston Public Library. Sponsored by Encore Boston Harbor. Generously supported by The Boston Foundation. Additional support from the great-grandchildren of Albert H. Wiggin, the Cordover Exhibition Fund, and anonymous funders. The MFA’s conservation team undertook the preparation and framing of pieces from the BPL’s collection for the exhibition. Nine oversized posters were also sent for extensive conservation treatment, framing and digitization at the Northeast Document Conservation Center (NEDCC) in Andover; this work was jointly funded by the MFA and the Associates of the Boston Public Library. Five of these posters are on view at the Museum in Toulouse-Lautrec and the Stars of Paris, while the remaining four are displayed at the BPL’s Central Library in Copley Square. Additionally, the BPL’s complete collection of more than 350 works by Toulouse-Lautrec has been digitized and is available on digitalcommonwealth.orgopens a new window. The Gund Gallery Exhibition Shop will feature a range of items inspired by Toulouse-Lautrec and the Stars of Paris, including prints of works by Toulouse-Lautrec in a variety of sizes, postcards, magnets, bookmarks, stationery and journals. Publications for sale include the exhibition catalogue, as well as both fiction and nonfiction books focused on artists, cooking and travel. Channeling the entertainment culture of 19th-century Montmartre, the shop is also offering absinthe fountains, reproduction glassware and accessories. Additional products include apparel, scarves, totes and jewelry, as well as a selection of puzzles, playing cards and children’s books and toys. Throughout the month of June 2019, BPL cardholders can sample MFA membership by presenting their library cards at any ticket desk to receive free admission to the Museum (for two adults and up to six kids per visit) and a 10-percent discount in the Toulouse-Lautrec and the Stars of Paris exhibition shop. Additionally, BPL cardholders can reserve discounted passes to the Museum year-round through local BPL branches. These passes provide admission for two people at $10 each. This program is sponsored by the Museum of Fine Arts, Boston, and the City-Wide Friends of the Boston Public Library. Encore Boston Harbor is a $2.6 billion five-star global destination gaming resort featuring 671 hotel rooms with sweeping views of the Boston skyline and Boston Harbor, an ultra-premium spa, specialty retail, 15 dining and lounge venues, and state-of-the-art ballroom and meeting spaces. It is the largest private, single-phase development in the history of the Commonwealth. Situated on the waterfront along the Mystic River and connected to Boston Harbor, Encore Boston Harbor will open up the Everett shoreline to the public for the first time in more than a century. The resort has privately funded a clean up of the heavily contaminated site and is creating a six-acre park along the water which will feature pedestrian and bicycle paths that provide access to the waterfront, an events lawn, picnic and public viewing areas. Ornate floral displays, retail and dining experiences will overlook the Encore Harborwalk. Encore Boston Harbor will connect to points across the harbor via a robust water transportation system that the resort is introducing. Low-profile European-style boats will be used to sail back and forth without the need to raise area drawbridges. Encore Boston Harbor is expected to open in mid-2019.